November 1, 2018. 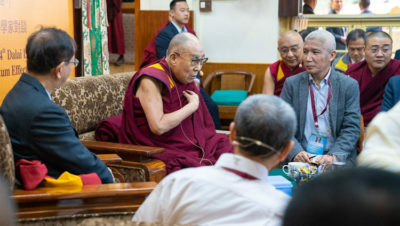 Thekchen Chöling, Dharamsala, India – The first discussions between Chinese, mostly Taiwanese, scientists and His Holiness the Dalai Lama took place in the Tsuglagkhang, the Main Tibetan Temple adjacent to his residence today. His Holiness walked to the temple, greeting members of the public who were waiting to see him in the yard. Once he reached the temple he acknowledged the assembled monks and paid his respects before the statue of the Buddha. After warmly greeting the nine Chinese presenters, he made a point of reaching out to old friends among the assembled guests. He then joined the presenters seated around a long table. Among the monks at the head of the temple were six Tibetan presenters, graduates of the Emory Science program, who will participate in discussions with the Chinese scientists in the afternoons. Approximately fifty guests sat in the back of the temple, including many who came with the Taiwanese group. About 270 Tibetans joined the audience: researchers from His Holiness’s office, as well as students from the Men-tsee-khang, the College for Higher Tibetan Studies, Sarah, the Tibetan Children’s Village and neighbouring schools. The meeting was conducted in English with simultaneous translation into Chinese and Tibetan being made available over FM radio. Proceedings were web-cast live. His Holiness opened the conversation. “Firstly, I would like to welcome all of you here. This is the first time we’ve held discussions with mainly Chinese scientists. I’ve taken part in dialogues with scientists for more than 30 years, but they have mostly involved Western scientists, Americans and Europeans, as well as one or two meetings with Japanese and Indians. “These meetings have two purposes. The first is to expand our knowledge. Until the late 20th century the focus of scientific research was mostly on external things. There was little interest in the mind, only investigations of the brain. The discovery of neuroplasticity, the recognition that changes can be seen in the brains of people who, for example, develop firm concentration, changed that way of thinking. Some scientists are now showing greater interest in the mind, even subtle consciousness. “There are cases of people who are declared clinically dead—their hearts have stopped, circulation has ceased and their brains are dead—and yet their bodies remain fresh. This was the case with my own teacher, who remained in this state for 13 days. Others remain for anything up to two or three weeks. This is a something to investigate. In the Buddhist tradition we have an explanation that concerns subtle consciousness remaining in the body during this period, but scientists haven’t been able to explain it yet. “So, one purpose of these meetings is to expand our knowledge, to include the mind as well as external phenomena, in order to achieve a fuller understanding. The second purpose of such discussions concerns the use to which knowledge is put. Despite the useful progress that has resulted from scientific research and technological advancement, there have also been destructive developments that provoke fear. Clear examples are nuclear and other weapons of mass destruction. Their development may have been a remarkable achievement, but their only purpose is to kill. “Scientists have discovered that constant fear and anger are damaging to our health. They undermine our immune system. On the other hand, cultivating a more compassionate attitude brings peace of mind that reinforces our overall good health. Here’s a simple example: most people prefer a smile to a frown. It’s human nature. Even dogs respond with wagging tails to a smile and other shows of affection. His Holiness explained that all 7 billion human beings share a common experience—their mothers give birth to them and nurture them with affection. Consequently, young children care little about differences of nationality, religion or race; they play happily with others who respond with a smile. He observed that as we grow up our education is oriented towards materialistic goals with little time for inner values. He recommended that education should include advice on how to achieve peace of mind. His Holiness mentioned that he had found his own Buddhist practice useful, but declared that he is no more able to say this or that religious tradition is the best, than he could say that this or that medicine is best in all cases. Just as the effectiveness of medicine depends on the need and condition of the patient, so different religious traditions with the different approaches are suitable for different people according to their disposition, culture and so forth. He suggested that at the present time ethics can be most effectively presented from a secular point of view on the basis of scientific findings. Looking over to Susan Bauer-Wu and Amy Cohen Varela, His Holiness praised the contributions the Mind & Life Institute has made in this direction. His Holiness mentioned that he sometimes feels a reluctance to discuss quantum physics with Westerners whose cultural background is based on Judeo-Christian in case it leads to a conflict of faith. He feels less difficulty in relation to Asians, particularly Chinese. He recalled that when the Chinese Buddhist monk Xuanzang came to India in the 7th century he studied at Nalanda University. He is reputed to have met Nagabodhi a direct disciple of Nagarjuna. Evidently, Chinese Buddhists are familiar with the name Nagarjuna and the Nalanda Tradition. Noting that relations between Chinese and Tibetans are thousands of years old, he conceded that they have sometimes quarrelled. At other times, such as in the 7th century, their ruling families have intermarried. Since 1974, it was decided not to seek independence for Tibet, provided Tibetans were granted all the rights they are entitled to under the Chinese constitution, including the preservation of their language and culture, as well as the protection of Tibet’s environment. His Holiness remarked that Tibetans can benefit from Chinese help in terms of material development, while Tibetans can share their knowledge of the Nalanda Tradition with Chinese Buddhists. On behalf of the group of presenters Prof Yuan Tseh Lee thanked His Holiness for inviting them. He described science as a language to communicate with nature, a language that we need to learn. Science is based on evidence. He added that since human population and consumption of resources are growing, causing us to recognise that we live in a finite system, science also has a social responsibility. 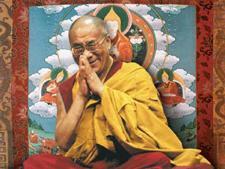 He told His Holiness they would like to hear from him how science, religion, humanity and nature should interact. His Holiness replied that when he first expressed interest in science, an American Buddhist friend warned that science is a killer of religion. He considered this and decided that since science is a method for coming to terms with reality, it is not a threat to the Buddha’s teachings. Dr Shih Chang Lee opened the scientific presentations with an explanation of space-time symmetry and quantum physics. He talked about Newton’s law of inertia and Einstein’s observation that massless particles move with the velocity of light, leading to his conclusion that velocity is relative, which is described as special relativity. Dr Chii Dong Chen opened his account of the entangled world by asking what we learn from nature and showing a video clip that compared the activities of foraging ants with a robot vacuum cleaner. He went on to discuss how birds navigate with particular reference to the Bar-tailed Godwit that flies across the Pacific Ocean to breed. He suggested that unique features of quantum mechanics, superimposition and entanglement, can help us understand birds use of magnetoreception. He introduced the contrast between a conventional computer that calculates serially and a quantum computer that can conduct a series of calculations simultaneously. Dr Chen’s pointing out that things look different from different angles prompted His Holiness to observe that from a Madhyamaka standpoint there is a difference between our perception of the world and its reality. He mentioned the quantum physicist from China who told him that in his experience some of his colleagues with deep understanding of quantum physics were less subject to emotional disturbance. He also recalled American founder of cognitive therapy, Aaron Beck’s description of an angry peoples’ sense that the object of their rage is completely negative as 90% mental projection. Dr Chen agreed that the observer is important because he or she is part of the perception. Dr Yueh-Nan Chen’s presentation was entitled ‘From Quantum Physics to Quantum Biology’. He discussed Schrodinger’s cat and jokingly reported that when he tried to explain it to his wife she asked why he wanted to kill a cat when to do so would be completely against Buddhist precepts. Everyone laughed. He also discussed the Leggett-Garg inequality which defies our intuition on macrorealism. Finally, Dr Shawn Y Lin described a modern photonic revolution. He observed that sunlight is the engine of life on earth. Max Planck postulated that light was only emitted in quantized form, an insight that has contributed to powerful lasers, LEDs and solar panels. He described ongoing research to improve solar panels to maximize their absorption and predicted that the next generation will be super thin, super absorptive and super effective. Nano-technology will allow for a film that is 98% absorptive of sunlight and only 10 microns thick. Concluding the morning’s discussions Prof Yuan Tseh Lee remarked that teachers encourage creativity and innovation, but such qualities derive from simple curiosity. His Holiness left the temple to return to his residence, interacting with people who lined the way. Lunch was offered to everyone attending the proceedings in the temple yard. In the afternoon, there were discussions between Tibetan monastics who have received scientific training and the visiting scientists. The dialogue will resume tomorrow morning.